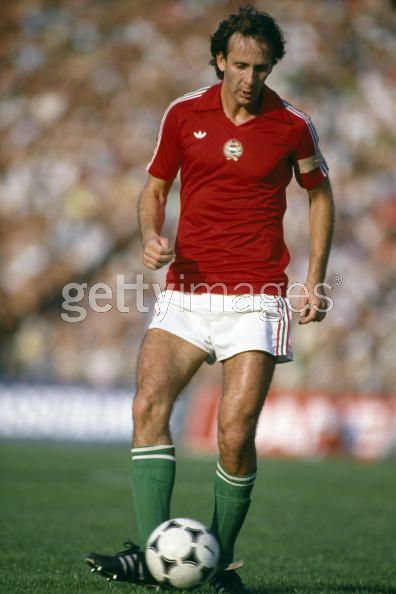 Readers who caught the video posted with “World Cup Classics : Hungary’s Record 10-1 Rout Of El Salavador” here on July 25 would know that it was the Hungarian captain, TIBOR NYILASI of TC Ferencvaros, who scored the first and last goals of the memorable, landslide Hungary v El Salvador match from the 1982 World Cup finals in Spain. 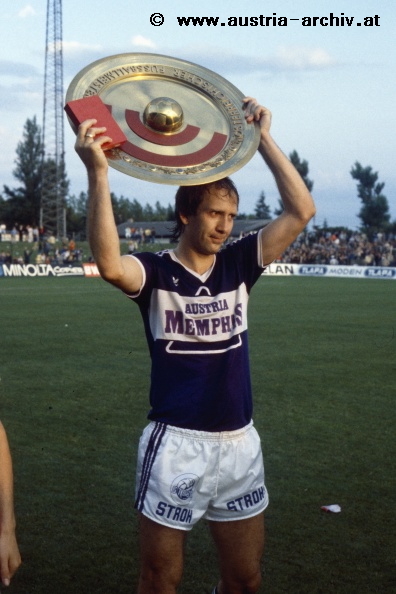 The Hungary international striker Nyilasi lifts the Oesterreichische Bundesliga Meisterschale (championship plate) for FK Austria Wien in the mid-1980s. At the age of 28, Nyilasi was permitted by Hungarian authorities to sign with FK Austria Vienna in the summer of 1983 for a transfer fee equivalent to what is today 500,000 Euros. In his first season as a legionnaire, the 1983-84 campaign, Nyilasi topped the First Division with 26 goals as Die Veilchen captured the Austrian championship. FK Austria Vienna, in fact, won the Bundesliga title the first three years running with the Hungarian star striker in tow. Nyilasi, who formed a devastating duo in attack for The Violets with Austria international striker TONI POLSTER, spent five seasons with FK Austria Vienna and scored 81 goals in 120 Bundesliga matches. The youthful Polster, perhaps profiting from his partnership with the experienced veteran Nyilasi, led the Austrian Bundesliga in goal-scoring three consecutive years from 1985 thru 1987. Today’s post is inspired by a man named ED CSONGRADI, who has spent seemingly forever giving of himself to The Game in the American community where this blog is produced.